Wattstopper radiant Tru Universal Dimmer features a clean design and self-calibration technology that adjusts to any light bulb. Because this dimmer automatically calibrates to the minimum and maximum trim levels of the lamp, it eliminates poor performance and flicker that can often occur at low light levels with LEDs. The wall box dimmer is compatible with virtually all lamp types from LED, CFL and incandescent, ELV and MLV (with the exception of 0-10V LED drivers). As the end-user changes or updates their lighting, the dimmer can be easily reconfigured with a simple touch of a button. The dimmer is designed to save time and space and ensure solid electrical connections with screw pressure-plate back wire terminals. It also supports traditional, wire-loop side wiring. It features a heavy-gauge black anodized aluminum strap, which provides superior heat management and structural strength for mounting against wall surfaces. 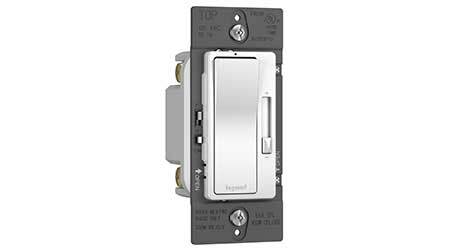 The dimmer combines an on/off decorator switch with a separate slider for easier dimming operation. It features an ergonomic slider grip for more intuitive finger control, and a larger paddle switch that is easy to see and use. A locator LED glows when off to make the dimmer easier to find in the dark. It is available with interchangeable faceplates that are available in White, Light Almond, and Ivory. Additional faceplates from Dark Bronze to Gray are available as an accessory, allowing the device to fit any style or décor.